Is patient to patient transmission of Aspergillus fumigatus possible? 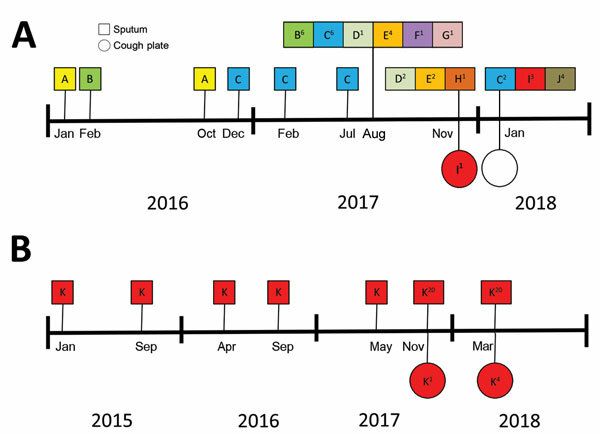 In this new study, isolates from sputum and cough plates from 15 patients known to be colonised with A. fumigatus were collected during routine quarterly visits and analysed. 18 sputum samples from 11 patients produced cultures along with 3 of the corresponding cough plates from 2 patients. The genotypes of the isolates cultured from each patient's cough plates and sputum samples were identical, suggesting that A. fumigatus can be aerosolised by coughing. The samples were taken following maximal inspiration and total expiration and the authors suggest that this may facilitate aerosolisation. Interestingly, the two patients whose cough plates cultured positive did not have cavity lesions or any other serious complications and aerosolisation occurred at a similar rate than that observed for Staphylococcus aureus. The authors point to previous air quality studies in intensive care units in which genotyping showed that samples from the air were identical to samples isolated from patients. Other studies have shown that samples with identical genotypes have been isolated from different CF patients and that these isolates could not be linked to the environment. Taken together these data suggest that patient to patient transmission is possible as is the case in other fungi, such as Pneumocystis jirovecii. This could have implications for infection control measures and therefore warrants further study.